HBO Go is BACK for all resident students! Housing and Residence Life is excited to announce that we will continue to offer HBO Go streaming service, for free, to all of our resident students. 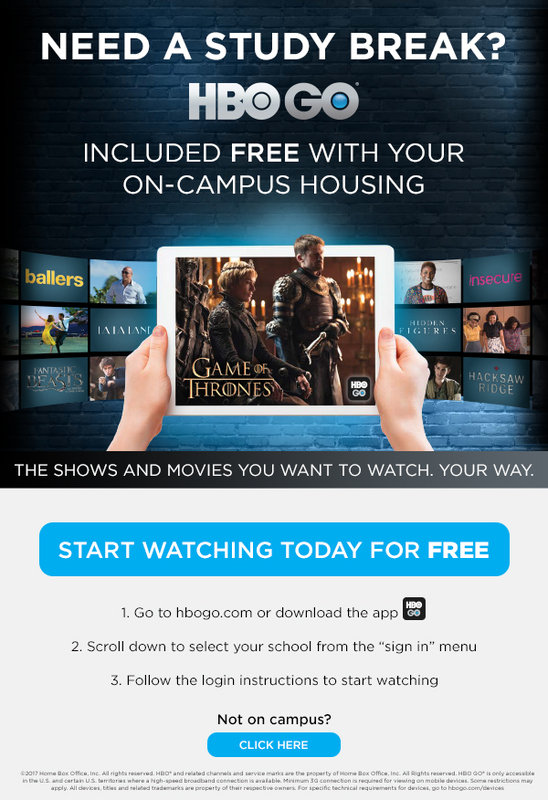 Earlier in the semester, all resident students received an E-mail informing them how to access their favorite streaming shows through the HBO Go app. If you missed it, check out the image below to start watching your favorite TV shows and movies now! Author Eric MochnaczPosted on September 19, 2017 Categories Residence Halls, TechnologyTags Cable, freshmen, HBO, HBOGo, Housing, residence halls, room assignment, technologyLeave a comment on HBO Go is BACK for all resident students!